Did you know... 40 U.S. states + D.C. require nonprofits to register before they solicit donors in their state? What's more, something as innocuous as the "Donate" button on your website could count as direct solicitation. If you have donors in multiple states that support your organization - both financially and in-kind - you'll want to check out today's post. We're joined by Michelle Boyer, President at Charity Compliance Solutions. 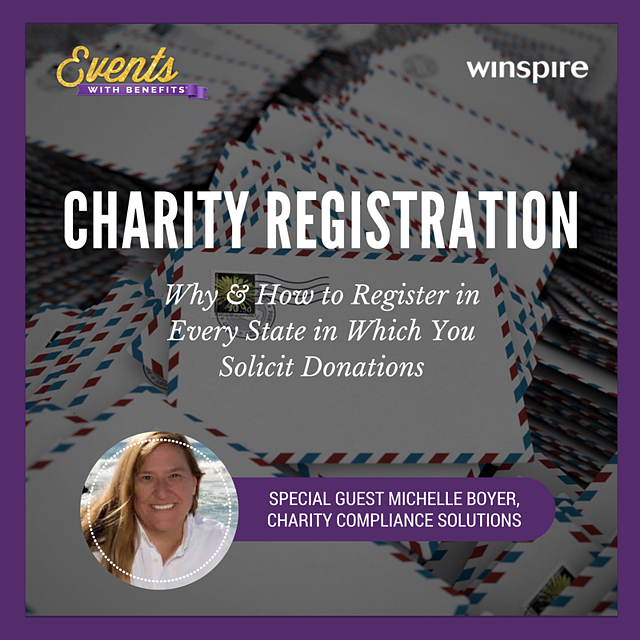 In a recent episode of our podcast, Events with Benefits, Boyer discusses how nonprofits can avoid legal troubles by getting registered in every state in which they ask for donations. Who needs to register before soliciting donations? Please Note: The recommendations in this post are not one size fits all. Additionally, legal regulations of charitable registration are constantly changing and vary state to state. This post is meant as a starting point, not a substitute for legal advice. Charity compliance refers to nonprofits registering in every state in which they solicit donations. These are the 41 states in the U.S. that require nonprofits to register before solicitation. Which nonprofits need to register, and who is exempt? Any charity that relies on donations to keep its programs and services running must register with states that require it. 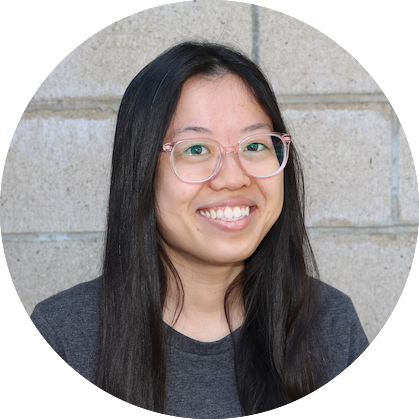 "One of the most common misconceptions I see is, say, a charity based in California thinking they don't have to register anywhere outside of California because all that money is coming into California. That's not the case," Boyer asserts. There are some exemptions. Membership clubs, like a homeowners association or rotary club, rely on dues to keep the organization going (not donations) and are typically exempt from this rule. Same goes for most hospitals, schools and religious organizations. However, there are exceptions. For example, universities are exempt, but not university foundations. Again we encourage you to seek case-specific legal counsel. Listen to the podcast episode below, or visit the full site here. Here are just a few ways you might be soliciting in a different state and not even know it. Emailing + E-blasts. Emails are considered active solicitation. "It's important to not just collect checks but keep good records," Boyer advises. On your website, when people subscribe to a newsletter, it's best practice to ask for the address as well. Otherwise, you don't know what states emails with direct asks are going out to. Donate button on the website. If you're a Florida-based charity, for example, with a donate button on your website that anyone could see, you could fall out of compliance. "A few years back, several Attorney Generals got together to discuss the Donate button and they came up with a few principles, called 'The Charleston Principles.' The agreement left the determination of whether or not a donate button is considered active solicitation to the states." Thank you letters. If someone gives a donation randomly and the charity sends a thank you letter containing an ask or means to donate (even something as simple as 'We appreciate your continued support'), that is considered solicitation. "If a charity isn't registered in Colorado and a donor from Colorado gives and you thank them like that, that's solicitation," Boyer asserts. What is considered a donation? Anything given to the charity: cash, goods, auction donations, in-kind donations, stocks, bonds and more. What happens if you get caught soliciting without registering? "The consequences include fines that can get hefty (into the thousands), or voluntary compliance agreements that you have to sign with the state and follows you around state to state," Boyer cautions. "The worst-case scenario: The state can make you give the money back to the donor and ban you from ever soliciting in that state again." If your charity has a national reach or you just want to play it safe, you might have figured out the best case scenario: getting registered in all states. Figure out where your money's coming from. Look at your direct mail, email blasts, platforms of cause marketing, Facebook, anything where you're visible to a lot of people. Start registering as soon as possible with states where you're getting donors that give on a regular basis, and from where you're getting the bulk of your donations. Register. Here's how Charity Compliance Solutions does it: "We obtain all your founding documents, from 1023 articles and bylaws to board lists. We put all this information into our program and complete an initial application with the state. All the founding documents go with it. Once everything gets approved, you are allowed to solicit in that state." Re-register annually. "A lot of people will do the initial registration and think that's all they have to do. Registration must be renewed (you send in a renewal with your 990) every single year," says Boyer. "A lot of times with turnover, things fall through the cracks. We've had organizations come on board that registered 5 years ago and didn't do anything, and unfortunately, late fees do accrue. But states always think it's better late than never." How much does it cost to get registered in all requiring states? "On the low end, for all states, $1,100. On the high end, it can cost you about $6,400. The price you pay per state, is based on your annual gross revenue. Massachusetts, for example, swings from $35 to $2000 per year based on your gross revenue." Some states may require an audit, which can be costly. How long does the process take? Some states are fairly quick. Five of them are online, and those get turned around within 72 hours. Most of the rest of the states take 3 to 4 weeks. Then there's some states like Illinois and New Jersey, where you're looking at 6 months. "The big push for states is transparency," Boyer explains. "States want to protect donors. Unfortunately, bad charities are the ones that make all the good charities have to do all this work." For further information, visit www.charitycompliancesolutions.com. Do raffles need to be registered with the state? What steps can a company like Charity Compliance Solutions take to get every nonprofit registered? How do state regulators enforce and monitor registrations? What's trending or new in the world of charity solicitation registration?